Permanent safety guardrails for fall protection comes in many shapes and sizes to address worksite needs. 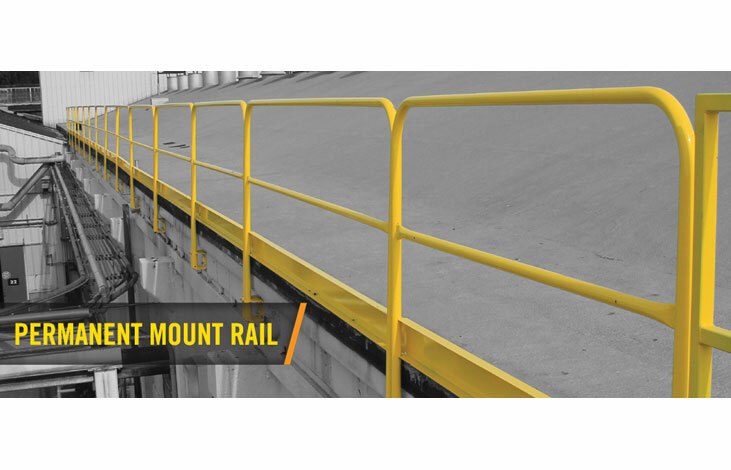 Our permanent mount safety guardrails offer the customer choices in length, height and mounting options. One of the most unique features of our guard rail systems is that they can be removed from the railing holder if needed. By simply pulling a pin, the railing section can be removed from the base plate. The only thing that remains in place is the railing holder itself. This flexibility greatly increases productivity by having fall protection in place when you need it and removed for access when it might otherwise be in the way. We offer floor mounted safety railing systems which can used in many areas like, loading docks, shipping pits, crowd control, access control to name a few. We also offer wall mounted guardrail systems. The guardrails mount to the vertical wall of a leading edge hazard. Shipping pits are a good example of installing safety railing holders on the inside vertical wall of the pit and inserting the railings into the holders. This eliminates anything mounted to your walking surface. To remove the railing, pull the pin and lift out the railings. This allows free and clear access to the truck in the shipping pit. We even do structural railing systems designed to mount permanently to a structure without the need for removal.